Summit Park, a Charlotte-based private investment firm, is pleased to announce the sale of its portfolio company Arkive to Access CIG. Terms of the transaction were not disclosed. 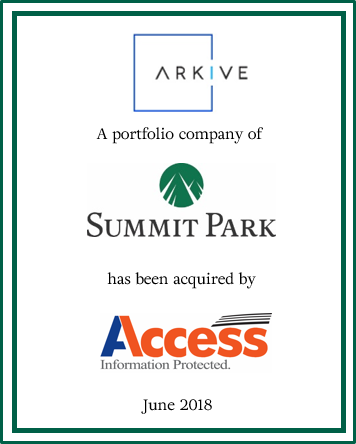 Headquartered in Atlanta, Georgia, Arkive was formed upon Summit Park’s acquisition of certain assets in the United States and Canada from Iron Mountain Inc. The company is a leading provider of records management solutions to a highly diverse base of customers in Seattle and Atlanta in the United States and in Montreal, Ottawa, Calgary, Vancouver, Edmonton and Toronto in Canada. The transaction marks Summit Park’s second exit from its second fund, Summit Park II which had a final closing on April 9, 2015. Arkive and Summit Park were advised by McGuireWoods LLP (legal advisor), Blake, Cassels & Graydon LLP (Canadian legal advisor), and PriceWaterhouseCoopers (tax advisor).